While Valmiki speaks of one Ravana, in subsequent tellings of Ramakatha, we find several Ravanas, each more powerful than the others, most of them more monstrous and gruesome, including a Ravana with one hundred thousand heads instead of the ten heads we are familiar with! One other major change we notice in these tellings is the change in the stature of Sita. While some tellings make her softer and more delicate than she is in the Valmiki Ramayana, some of them make her far more powerful. In many of these new tellings, she frequently replaces Rama as the true source of power, as someone who can do, sometimes effortlessly, things far beyond Rama’s capacity. Hanuman is already the accomplisher of impossible deeds in Valmiki’s Ramayana. But with each subsequent telling of his story he grows, to become a doer of even more awesome and impossible deeds. The texts claim to be parts of the lost Mahabharata narrated by Jaimini — instead of, Vaishampayana whose narration of the Mahabharata is what we are all familiar with — of which only the Ashwamedha Parva survives. It is this Yogamaya that is born as Sita while Vishnu takes birth as Rama and kills the ten-headed Ravana. When Sahasramukha Ravana learns of the death of Dasanana, he abducts Bharata and Satrughna while they are asleep, mistaking them for Rama and Lakshmana. The demon marries his two daughters to them but keeps them in his palace. Rama informed by the gods and urged by them to kill Sahasramukha goes to his city, Visala, along with Hanuman and his army of humans, monkeys and Rakshasas. The gods join them. But all of them together are no match for Sahasramukha, including Brahma, Vishnu and Shiva. He beats them all in a brutal fight. Sita is seated on the Pushpaka watching it all, her heart filled with grief at the fall of her husband and the gods. The heavenly sages now praise her as the One Goddess Who is All. You are Svaha! You are Svadha! Instantly Hanuman becomes five-faced — he now has the faces of a lion, a horse, Garuda, and a wild boa — apart from his own monkey face. Sahasramukha Ravana now wants to kill Sita and a fierce battle ensues between the two. Such is Sita’s might that she uses not proper weapons to fight the demon but darbha grass. She swallows Sahasramukha’s awesome missiles empowered by Sage Durvasa’s ascetic power and aims darbha grass blades at him, which become mighty columns as they speed towards the demon. At the attack of Sahasramukha, the grass columns splinter into a thousand fragments, which the demon swallows. Inside his belly the flaming fragments reunite and the furious fire reduces him to ashes. The trinity and other gods now propitiate Sita. Brahma sings her praises, calling her “Maya, Vaishnavi, Durga, Lakshmi, Gauri, Saraswati, Svaha, Svadha, Dhriti, Medha, Hri, Sri…Varahi, Bhadrakali” and all other goddesses. Requested by him, Sita withdraws her effulgence into herself and once again becomes human, womanly bashfulness appearing on her face. Hanuman too withdraws his five-faced form and appears in his normal form. 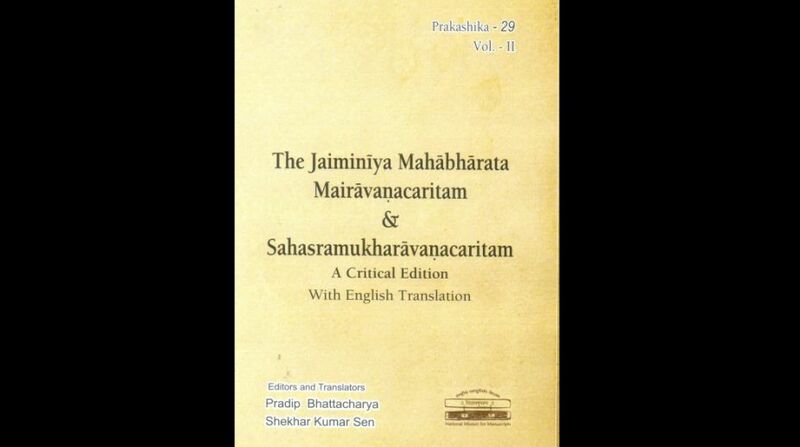 Mairavanacharitam Sahasramukharavanacharitam is the second book of the twin volume set, the first and shorter volume being Mairavanacharitam, also called Maruti-Mairavanacharitram. What the book essentially does is glorify Hanuman and his amazing powers and deeds. The story begins towards the end of the Ramayana war when Ravana is still alive, but has lost all his mighty rakshasa combatants. He thinks of Mairavana, the ruler of the nether world who instantly comes to him. Pradip Bhattacharya and Shekhar Kumar Sen have located the manuscripts of the two works, got them transcribed from Grantha Tamil to Devanagari and then critically edited them to arrive at texts as complete as currently possible. The editors have then translated the works into English, keeping as close to the syntax of the original text as possible. This is work that requires great dedication, total commitment, true scholarship and an immense amount of hard work. The literary quality of the original Sanskrit texts is not great, nor is there complete consistency in the narration, as the editor-translators point out in their long and very valuable introduction. The author of these two works, Jaimini, seems to have had a “somewhat casual attitude” towards them. Though the works are claimed to be that of Jaimini, this Jaimini seems to be different from the famous Jaimini, one of the five disciples Sage Vyasa. While the two stories are fascinating, the dominance of magic in them take the books closer to what we call tilismi literature, like the legendary Chandrakanta and Chandrakanta Santati in Hindi, rather than to the Indian epic tradition. The translation is consistently outstanding, which is not always the case when it comes to translating Sanskrit verse into English verse. The great mastery of the editor- translators over English language and literature is certainly one reason behind it. Keeping the translation as close in syntax to the original text has its own charm. The translators need to be congratulated for achieving this difficult task. In a few places I found the translation can be improved — like darbha is not just grass but sacred grass, padapa means plants as well as trees (and grass too, strictly speaking), though in one place it has been translated as plant where the text means tree (Ch 47.51). In chapter 48, when Brahma praises Sita, he calls her “Sakhi ofBrahmana and Vasudeva”. In the original Sanskrit it is brahmano vasudevasya sakhi, meaning a friend of Brahma and Vasudeva. In the Sanskrit text of the same verse, durjneyavaibhavaa (one whose glory cannot be easily known) should be one word instead of two and so on. These minor drawbacks do not in any way reduce the immense significance of the splendid work done by the editor-translators. What they have done is to make a superb contribution to the study of ancient Sanskrit literature, and the fact that they discovered the text and saved it from oblivion makes their work all the more praiseworthy. This is a truly masterly work for which all lovers of Ramakatha studies, Sanskrit literature and Indian culture will remain deeply indebted to the scholarly editor-translators.